4 Functions in one leash! The Ultimate in versatility - For whatever application you need a dog leash for, the Vario 4 Multi Function Leash has it covered. Perfect for hiking, days out or just your everyday walk. Why buy multiple leashes when you can have one leash that does it all? While walking you can go from a 185cm leash to a 100cm leash by pulling the leash through the D-ring at the collar end of the leash. Bring the handle back one more time and you now have a 72cm leash. You can then go back to a 185mm leash by just pulling on the D-ring. It's that easy! It also functions as a temporary check collar and can be used as a tether if you want to tie up your dog for a couple of minutes. 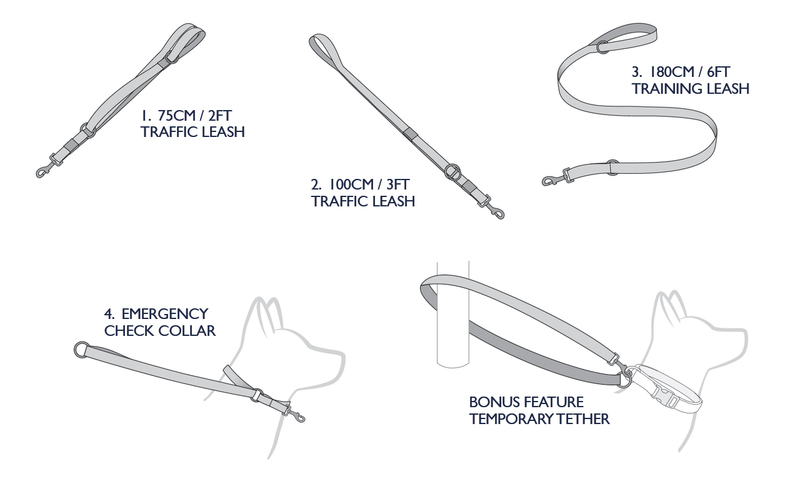 Our own proprietary blend of super soft nylon webbing is the base to this simple but ingenious leash. This leash really is a pleasure to hold, durable and amazingly strong - We then finish it out with reflective trim for night time safety. This Vario 4 LITE leash has been designed specifically for dogs under 20kg, with 12mm webbing and hardware that is smaller but still up to the same high quality that you expect from EzyDog. "I have three gorgeous pups and got this leash in three different colours — incredible quality! Love the different uses. Soo impressed with how well made this is and just love the brand! " "We have two dogs & after spending too much on junky leashes, collars & harnesses, we now only buy EzyDog products. The Vario 4 Multi Function Leash is my latest purchase & I'm very happy with & would recommend this leash." "I'm so happy for this multi-function leash. It's fantastic!!" "A brilliant leash. We have six of them for our three French Bulldogs - they also have EzyDog harnesses, etc, etc"
She has just recently had to replace the candy coloured one and thought I would like a different colour. A girl does like variety. The outlet we buy from only stocked the same candy colour. Mum considered for a minute buying a different style to get a new bright colour, but she just couldn't get past how much she LOVES the versatility of the Vario 4. My big brother (he is a ridgeback too) has the same in black. Mum says she understands which rules apply depending on the length of the lead..she likes that it is simple for her to hold, and understand ;-) and she feels safe & secure . "I love our green camouflage vario 4 leash, it's so light and easy to use, and I always feel so much safer linking the lead around a post and knowing that it can click back up onto itself and not having to worry about a knot coming undone. I just wish that EzyDog could also make BubbleGum a permanent colour and also make a Vario 4 leash in it for all of the girl dogs as personally none of the other colours really look nice on the girls compared to bubblegum, and it's always nice to be matching." "I have just replaced my all my dogs leads with only two designs - and this is our new everyday lead (the other is a different style for obedience trials). This lead is lovely and soft, but still strong enough to comfortably hold a pulling Siberian husky. It is also extremely versatile due to the clever design. A great lead that we will be using well into the future. Highly recommended to all dog owners."